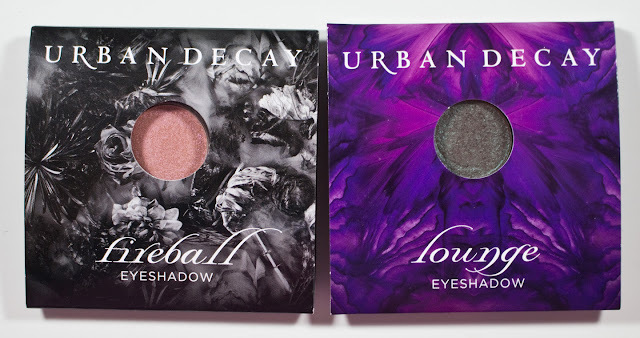 The Urban Decay Eyeshadows retails for $19US and $22CAN for 1.5g / 0.05 oz. worth of product. 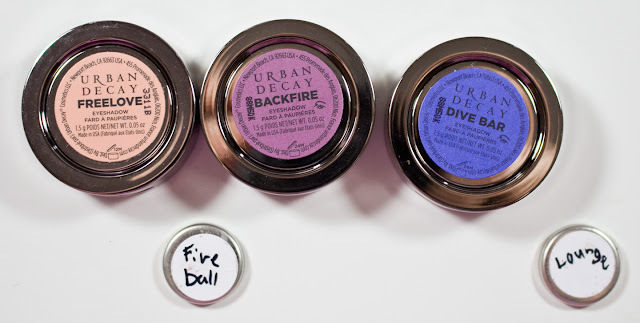 Urban Decay Eyeshadow in Freelove, Backfire, & Dive Bar. Token full size eyeshadows. Urban Decay Eyeshadow in Fireball & Lounge samples envelopes. Urban Decay Eyeshadow in Freelove, Fireball, Backfire, Dive Bar, & Lounge. Freelove Talc, Caprylic/Capric Triglyceride, Zinc Stearate, PTFE, Ethylene/Acrylic Acid Copolymer, Sodium Dehydroacetate, Phenoxyethanol, Sorbic Acid. 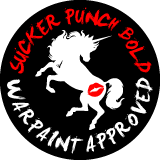 May contain: CI 77019 (Mica), CI 77891 (Titanium Dioxide), CI 77491/77492 (Iron Oxides), CI 19140 (Yellow 5 Lake), CI 75470 (Carmine). Fireball Mica, Caprylic/Capric Triglyceride, Stearyl Dimethicone, Talc, Zinc Stearate, PTFE, Sodium Dehydroacetate, Phenoxyethanol, Tin Oxide, Sorbic Acid, Ethylene/Acrylic Acid Copolymer. [+/- (May Contain): CI 77891 (Titanium Dioxide), CI 77491 (Iron Oxides)]. Backfire Mica, Caprylic/Capric Triglyceride, Stearyl Dimethicone, Talc, Zinc Stearate, PTFE, Silica, Sodium Dehydroacetate, Phenoxyethanol, Tin Oxide, Sorbic Acid, Ethylene/Acrylic Acid Copolymer. [+/- (May Contain): CI 77891 (Titanium Dioxide), CI 75470 (Carmine), CI 77742 (Manganese Violet), CI 77510 (Ferric Ferrocyanide), CI 77400 (Copper Powder)]. Dive Bar Mica, Caprylic/Capric Triglyceride, Stearyl Dimethicone, Talc, Zinc Stearate, PTFE, Sodium Dehydroacetate, Phenoxyethanol, Sorbic Acid, Tin Oxide, Ethylene/Acrylic Acid Copolymer. [+/- (May Contain): CI 77891 (Titanium Dioxide), CI 42090 (Blue 1 Lake), CI 77510 (Ferric Ferrocyanide)]. Lounge Mica, Caprylic/Capric Triglyceride, Stearyl Dimethicone, Talc, Zinc Stearate, PTFE, Sodium Dehydroacetate, Phenoxyethanol, Sorbic Acid, Ethylene/Acrylic Acid Copolymer. [+/- (May Contain): CI 77891 (Titanium Dioxide), CI 77491/77499 (Iron Oxides), CI 77288 (Chromium Oxide Greens)]. The shimmer and pearl shades all were nice to work with and pigmented as well. 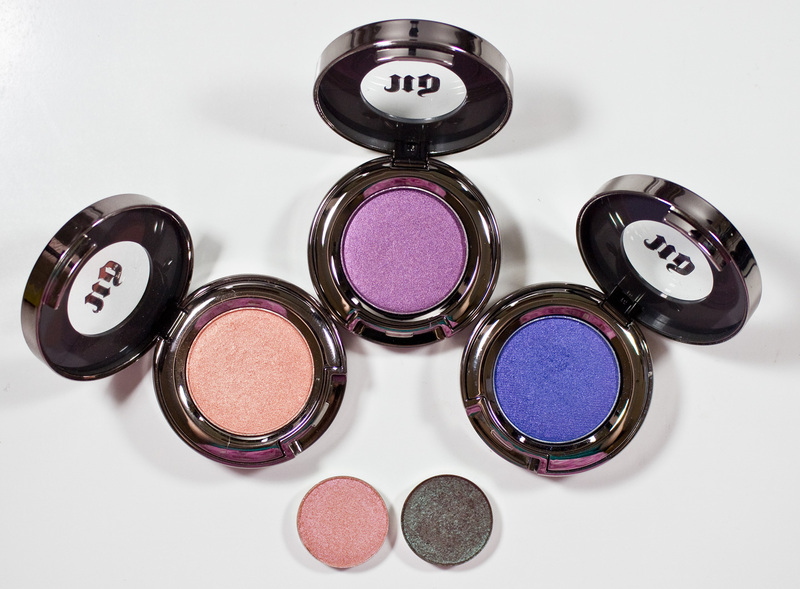 The texture of these eyeshadows are smoother and buttery due to the base formula. Freelove is a bright peach with a shimmer finish. Fireball is a pale orange base colour, with a pink pearl shift. Backfire is a red based purple with a mauve shift. Dive Bar is a medium blue with a mauve shift. Lounge is a red-based brown with a green pearl shift. Wear: I get 6 hours wear on their own. Urban Decay Eyeshadow in Half Baked full size pan, Sin Shadow Box palette pan, Fireball sample size, and Yaby pan size. Classic Urban Decay token compacts in gunmetal for the full-size pans. The Shadow Box & Ammo palettes are slightly smaller at 3/5tcompareded to the full-size pan. 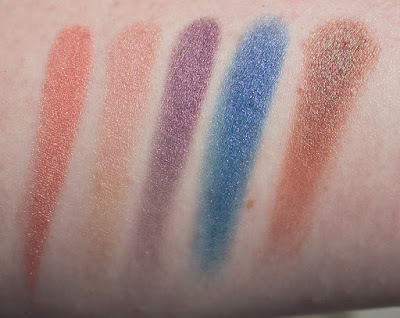 a Size wasn't given for the Urban Decay sample eyeshadows but they look to be about the same size at the rectangular palettes and larger than my slightly deeper well Yaby eyeshadows. 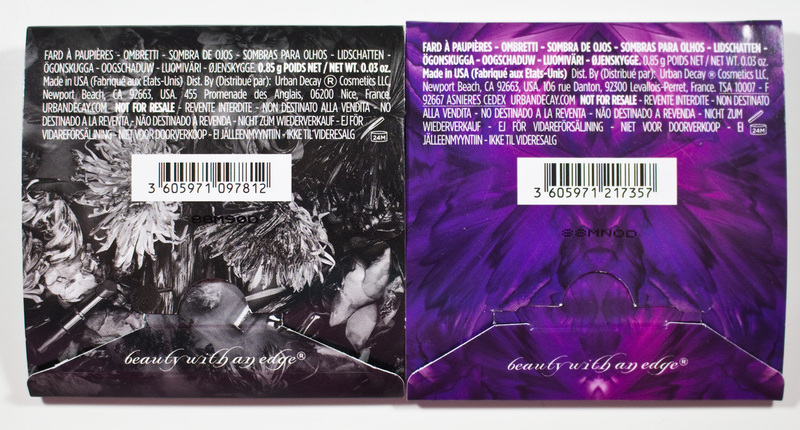 I really am a fan of urban Decays duo chrome shades. 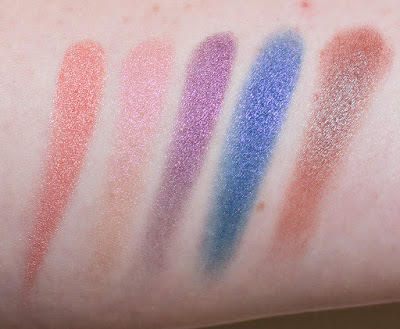 Most of these do run on the more subtle side but they are still noticeable on the lids.